You know how you hate doing laundry? Someone just solved that. 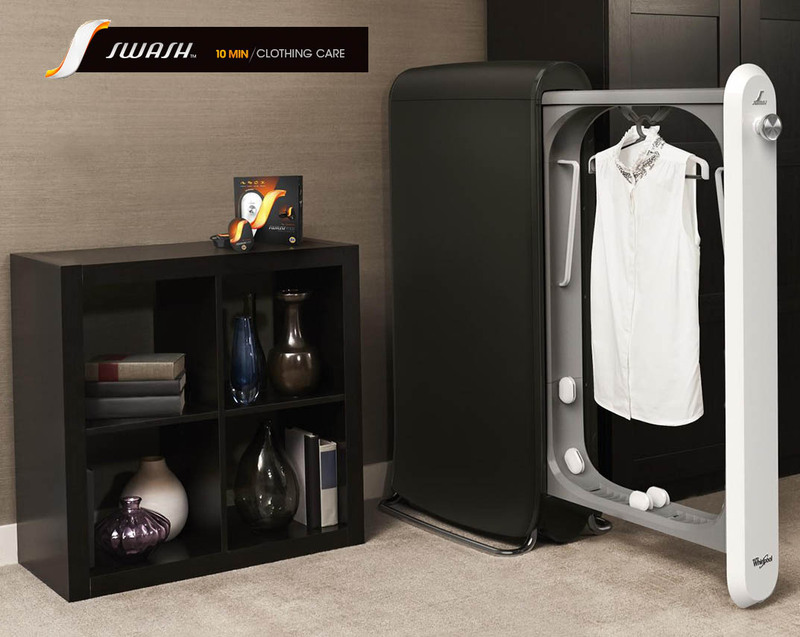 That’s why I think the Swash is easily the most important tech innovation of 2014. The value proposition of this device is amazing. It can clean and de-wrinkle clothing in 10 minutes for under $1. It can even handle dry-clean only clothes. So it pays for itself in under 1 year if you dry clean something once a month or if you value your time at anything above minimum wage… you know, that time that you currently spend doing laundry. The average couple spends 20 minutes a day doing laundry. They also spend 37 minutes a day arguing. Top complaint? Laundry. 1 in 4 working moms cries alone at least once a week. Top cause? Constant stress from excessive housework. That’s ridiculous. This should have been invented 100 years ago. But I’m still glad it’s here now. The Swash isn’t perfect yet. It can’t do an entire family’s laundry by itself. And it can’t clean the dirtiest of clothes. But even reducing laundry to a once a month activity instead of twice a month is a huge improvement. I’m also excited about the idea of picking up a dirty shirt off the floor in the morning and thinking, “Oh, sweet I’ll just wear this today”, and having it come out less wrinkled, less worn out, and nicer looking in 10 minutes than anything I’ve ever put in a washer and dryer for 2 hours. What’s its capacity? One shirt at 10 minutes is a pretty grim reduction over the ability to wash my entire laundry, then my wife’s entire laundry, then my baby’s entire laundry in three loads in a high capacity washer. We rarely dry clean, as none of us need to wear suits for work. Want. Suits and shirt laundry is making my life boring. Do you have one, and can you attest to its effectiveness? I looked at this. The cleaning packets smell disgusting and gave me an instant headache. I’m pretty sure it mostly works by drenching your clothes in strong smelling chemicals so you can’t smell the odors anymore. Yes, amazing! Laundry is evil! Anything to reduce that evil is a blessing on the world. What? People get emotional over laundry? Life is that hard? I can’t even. When life is at very busy and stressful stages – and professionalism requires you never to show that stress – it can come out when you’re doing these tiresome tasks that are eating into your sleep time at the end of the day. I once broke my hand punching a brick wall after a rubbish sack burst I was carrying in my hallway at 1am. Wouldn’t recommend that; made emptying the rest of the bins even more annoying. 20 min/day is the average for a couple. So that’s counting 2 people’s laundry. Also, I think it’s somewhat ridiculous to claim that it’s 20 minutes of work per load when you have to slavishly wait by the washer/dryer and immediately respond to it. If you fail to immediately transfer to the dryer, your clothes will rot and need to be rewashed multiple times. If you don’t immediately unload the dryer, all the clothes are permanently wrinkled (unless you also spend another couple hours ironing them all). Even just folding all the clothes from a load of laundry takes over 20 minutes if everything goes perfectly. You seriously need to get a modern washer. A modern washer leaves clothes so dry that we’ve let it go well over 12 hours before we have any trouble, and I think we’ve even got away with 24 hours. Having to do laundry in any amount smaller than 10 pieces at a time would *hugely* increase the amount of time I spend on laundry. Also, I almost never fold anything; I hang my shirts, and socks and underwear go in the drawer. The only thing that gets folded is pants, which I wash rarely because they’re not what gets dirty. IOW: whether this is awesome depends entirely on how you do laundry. Heck, I hang my shirts on the shower curtain rod ~5 minutes after they go in the dryer. That’s enough time to get the wrinkles out from the high-speed spin in the washer. No waiting for the buzzer. No over-cooked clothes. Sure, they still need to dry – but I could use the humidity in the house. I don’t know where you’ve been doing your laundry, but it takes awhile for clothes to rot in the washer. I frequently don’t do the switch for up to an hour, clothes not smelling at all worse for wear. There’s a simple trick to deal with wrinkles if you didn’t unload dryer within 30min. Toss in a wet paper towel and run dryer for 10min. No more wrinkles! Folding takes about 15min max. I fold like once a year. I should do it more often. It’s relaxing. Life really isn’t that hard. You don’t need to slavishly wait. You go do something else. We usually start it at night and go to bed for example. It takes more time and attention to fold towels. The clothes don’t get permanently wrinkled, at least our dryer has a “freshen up” setting that quickly tosses them around and handles the wrinkles. But again, we’re not talking suits. We’re tshirts and underwear. We hang our jeans up to dry, since the dryer’s main cost is that it very efficiently shortens the life of your clothes and quickly wrecks nice jeans. I guess I expected some folks to disagree that laundry is annoying or hard. My counterpoint is that I understand that point of view, but I also notice that almost everyone I’ve ever known seems to have a surprisingly strong aversion to doing their laundry. It’s like doing dishes or any other boring, thankless chore. It true that you can accomplish it if you really want to. But it’s a drain on willpower and very boring. Swash seems to reduce boredom and conserve willpower. People who are less bored and less worn out are more fun to be around. I’d just like to see my friends have more time for love and creativity. My assertion is that using swash would *considerably* increase the amount of time (and hence, boredom and willpower) I would have to spend doing laundry. I don’t disagree, in the slightest, that laundry is annoying or hard; I’m asserting that *for me* and my laundry distribution and the quality of my washer and dryer and probably other factors I’m not even thinking of, swash is opposite-of-helpful. If I wore a suit to work every day, I would have bought one within a *seconds* of seeing this post, however. It’s all about the nature of your laundry. I throw everything in a bucket, I run it once a week or every 10 days maybe (and frequently leave it in the washer overnight and then again in the dryer overnight because I forget about it), spend 10 minutes hanging everything, and that’s it. My children’s clothes require more time than that, but my children also produce between them about a dozen items of clothing needing washing *per day*; doing that in the swash would make me stab someone in the face. Future you should be thanking you for the clean clothes and dishes. It is definitely not a laundry alternative.. Swash itself doesn’t claim to be one! But yes a pretty good after-laundry system. Thanks for the great feedback, Louie! Let me know if you want one. I work for Whirlpool and we have a Friends & Family discount program . I agree. Buying it now. I spend like 20 minutes on laundry every 2 weeks, I can’t imagine having to spend 20 minutes a day, that would drive me insane. Hey Louie, I’m trying to settle an argument with a friend…did you get paid to advertise this? lol. no. i found out about swash while researching if anyone in the world had made an automated folding or ironing machine (not really). i’m definitely surprised by peoples’ response though. i expected more people to intuitively agree that reducing chores was a good thing, and not for the majority of my friends to rationalize away the difficulty of doing laundry as much as the average group of people rationalizes away the difficulty of death. Funny that you mention the automatic folding and ironing machine. I have frequently thought that this would be a great idea for Whirlpool to do. The other one is to remotely remove meat from my freezer and defrost it in time for dinner. Louie: I think part of the reaction is coming from mentioning this as a ‘laundry’ replacement, instead of a ‘dry cleaning’ replacement. I know my approach to clothes changed dramatically when I went from wearing a different t-shirt every day to the same five shirts once a week, and I now have a need for something like this (but also know it’s not going to get used for my sheets or towels or boxers or so on, which dominate my current laundry usage). Good as robot research I suppose, if impractical for its stated purpose. This seems like more a solution for dry-cleaning/ironing than laundry (at least, the way I use my laundry machine). Looks pretty sweet though! Louie are you going to buy one? I am shocked that the average couple argues for 37 minutes a day! This doesn’t replace dry cleaning, nor does it actually “wash” your clothes. It gives a light spray of scented liquid, but doesn’t give a true clean. I’ve tried other “dry cleaning alternatives” like the spray+dryer method, but they don’t deal with anything worse than medium strong odors or any type of stain. Even on their website they don’t claim this will reduce more than 50% of dry cleaning visits. This device is basically a fancy automated steamer, and the difference between this and typical steamers is that it is slightly more convenient and less time consuming for the user (and a lot more expensive, especially considering the ongoing cost of use). It’s an interesting device for some people with very specific problem, but it’s definitely not going to revolutionize laundry. I don’t use harsh chemicals, artificial smells, colors, or preservatives. I’m allergic to sulfates and sulfites. This doesn’t seem safe.